I love a rich bowl of clam or corn chowder on a cold evening. I do not seem to make it as much as I probably should. I cannot even remember the last time I even enjoyed a bowl, to be honest with you. I do remember eating it very often when I first moved to the Bay Area, at a local place called Spenger’s Fresh Fish Grotto. I wonder if that place is still around? Doesn’t matter as for now, I have the best recipe for New England Clam Corn Chowder. This recipe is the best of both worlds, a little bit of clam and a little bit of corn. This particular recipe for Clam and Corn Chowder is part of their fast and economical section. It has a nice base of bacon fat, onions, carrots, thyme, and rosemary, which I cooked until the veggies were slightly soft and the herbs were incredibly fragrant, as well, one can not go wrong with the smell of Applewood bacon fat cooking in your kitchen! Next, I added milk, chopped clams, some potatoes and corn and gently simmered for about 20 minutes until the potatoes were slightly tender. 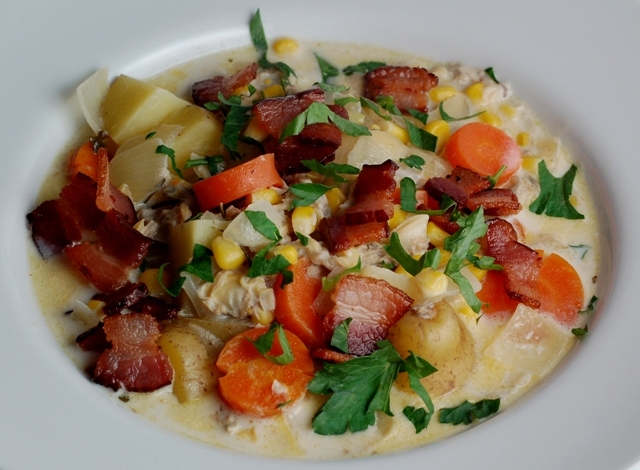 I thought this chowder was very tasty – creamy from the milk, but not too heavy as it would have been using cream, smoky from the bacon, flavorful with the addition of fresh herbs and colorful by using the veggies. It just needed a little extra salt when serving. I really enjoyed it. Lenny, on the other hand, said, “he wishes I had not told him it was Clam Corn Chowder, because, who eats clam chowder with corn in it let alone chowder with color?” He thought it was a terrible example of clam chowder as one would expect it to be. He is not saying that all clam chowder should be the same as Legal Seafood but it is a pretty high standard. He wishes I would have told him it was just some soup I came up with. 4 Responses to "New England Clam Corn Chowder"
This is more of an interesting soup then it is a "Clam Chowder." Awww Lenny—It wants to be clam chowder. So, how was the ratio of clams to chowder anyway? 3 cans sounds like a lot. Do you think you could have gotten away with using less? It sounds and looks really good. And I also like that it uses milk instead of cream. This is a great twist on an old favorite - Actually your looks much better! !